I was invited to join some friends from Dunfermline for a birthday lunch and general catch up. They chose the Inn at Kippen as it was roughly half way and was somewhere they had always wanted to try as they had heard good things about it. What should have been a spectacular drive round Loch Lomond and into the Trossachs, was a journey through mist and rain listening to how hot and sunny it was in London – thanks a lot, Radio 2! It only took about 40 minutes to get to, so I was very excited to think that I may have found a new lunch spot with good walking possibilities. 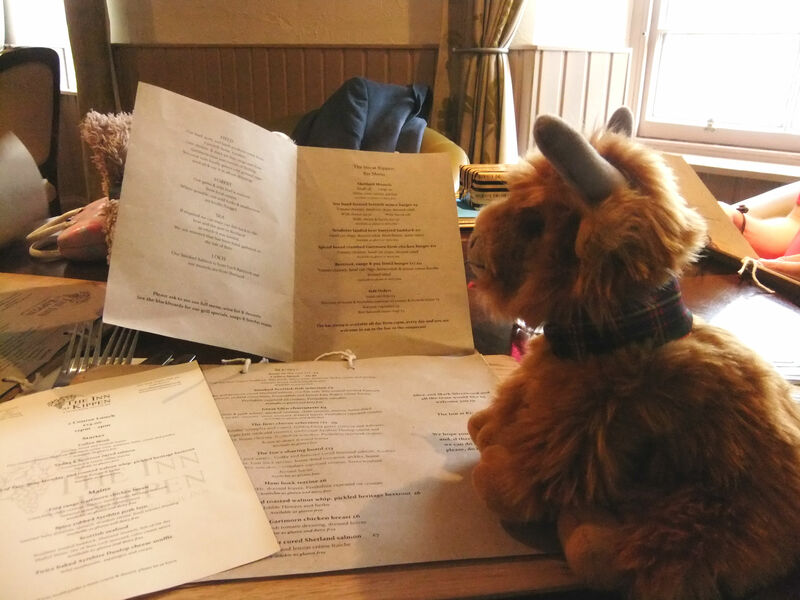 We were presented with three different menus: Set Lunch, Bar Menu and A la Carte and were told that we could mix and match dishes from the bar and à la carte. Well, what a huge choice, though sadly not so much for vegetarians like me. The set lunch of two courses for £14 offered a blue cheese salad starter followed by cheddar cheese soufflé. Now, I like cheese, but not all veggies do, and I certainly didn’t fancy it as the main ingredient in both courses. However, the set menu is very good value when you look at how much each dish costs on the à la carte, and for omnivores, it does offer a good variety of dishes, all made with fresh, locally sourced ingredients. My companions were spoiled for choice while I was struggling to find something I fancied – I feel that £11 for a lentil burger is rather a lot, especially when a (I shudder to say the word!) beefburger is £9.00!! One of my companions wanted to have the cheese platter starter and we decided to share that as it had five different cheeses, two chutneys, salad, oatcakes and bread. His wife went for ham hock terrine which she said was yummy. I was intrigued to find that the “walnut whip” was a tasty cheese spread and not a well-known chocolate! We kept the cheeseboard so I could keep picking during the main course, which I did with great relish (pardon the pun). For mains, they chose the burgers with cheese and bacon while I had the soup (leek, potato and onion). Their little girl had sausage, chips and peas followed by ice cream. I have to admit that I found my soup a wee but bland. However, my companions loved theirs and declared their burgers to be the best they had ever had. They can’t wait to go back. Two mains, three starters, two glasses of wine, a glass of prosecco, squash, a bottle of sparkling water and a mocha came to just over £66.00 excluding service. I had an email today from the owners of The Inn at Kippen, who took over earlier this year. The menu, therefore is still a work in progress: vegetarians, vegans and others with specific dietary requirements are encouraged to discuss menu options as many can be adapted. The burger prices on the menu are incorrect: the lentil burger is actually £9.00 and the mince burger £10.00. As mentioned in my original post, the waitress was extremely knowledgeable about the menu and the service was excellent. Kippen is a very pretty village and I wish Alice and Mark Silverwood every success. It is refreshing these days to find pubs that cook fresh using local ingredients. This entry was posted in Food, Restaurant Review and tagged Food, Lunch, Restaurant. Bookmark the permalink.